One of the things I love most about winter is indulging in the kinds of substantial comfort foods that you wouldn’t necessarily want to cook or eat in the middle of summer – like braises that need to cook for several hours in a hot oven. While I always really enjoy short ribs (Jenny and I even had them on the menu at our wedding), until a couple weeks ago I’d never actually cooked them at home. But when I found myself standing at the meat counter staring at racks of short ribs on a seriously cold day, I knew it was finally time to try them out. This recipe started when Jenny suggested Chinese five-spice powder as an ideal flavouring for the ribs. I agreed, then immediately thought of cocoa powder as the ideal partner to five spice and wine in a braise. You’ll notice that the recipe below actually calls for red wine and beer. I was originally just going to use wine, but subbed in the beer when I realized we were short on leftover wine. The end result still turned out delicious, with the sweetness from the five spice and the earthy, smoky notes from the cocoa powder pairing perfectly with the flavourful ribs. I ended up cooking this in the oven for three hours, which produced an amazing, thick sauce, but made the ribs a bit too fall-off-the-bone for my liking. As a result, I’ve suggested braising for 2.5 hours in the recipe below… check it at that point and if it needs a bit more time, just pop it back in the oven to finish. Heat oil in a dutch oven or other large oven-proof pot over medium-high heat. When hot, sear ribs in small batches on both sides until browned. Remove ribs and set aside. Turn heat to down to medium. Add fennel and garlic and sauté a few minutes until translucent. Add onion and sauté several minutes more until it becomes soft. 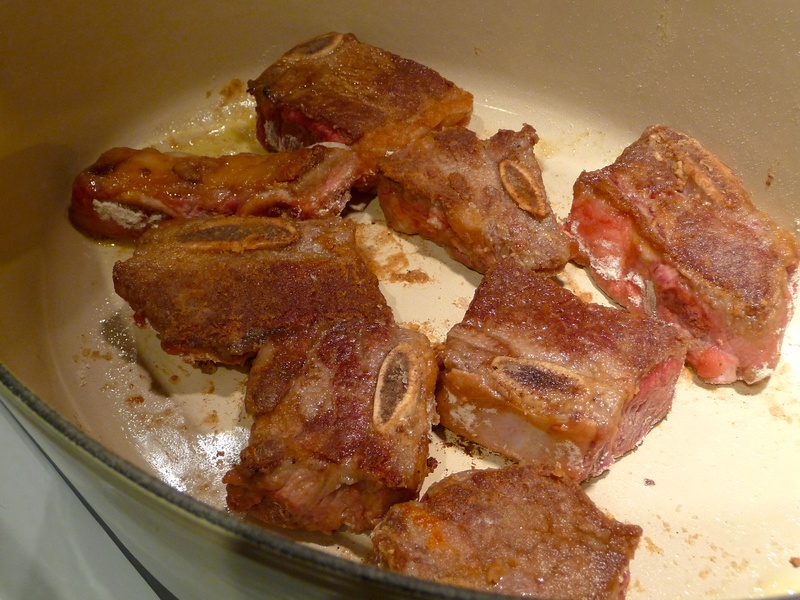 Add ribs back into pot. Stir in cocoa and 1 TBS five spice, then add wine and stock. Turn heat back up and bring everything to a boil for a couple of minutes. Cover with lid and put in oven for 2.5 hours, or until fork tender. Winter isn’t on my top three list of seasons. There, I said it. Maybe it’s because I don’t know how to ski or snowboard. Maybe it’s because I spent five consecutive winters in Ottawa, followed by five consecutive winters in Winnipeg. Whatever the reason, something about fall’s ugly sibling makes me want to stay in my house and eat bacon until my brain explodes. But of course, winter isn’t going anywhere. Which is why Jenny and I have decided to wrack our brains and scour our city to bring Communal Table readers our take on surviving winter, and maybe even enjoying it in the process. 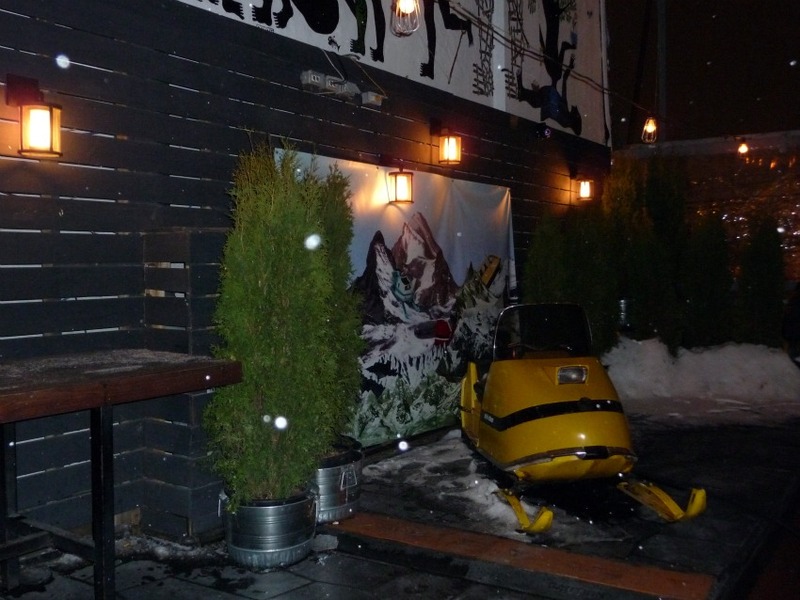 In our first installment, we visit one of our favorite places to hang out in Toronto, the Drake Hotel, to check out their Apres Ski Sky Yard. While the Drake’s restaurant and lounge areas have developed a reputation for consistency with creative cocktails and locally inspired food, the rooftop space has been a bit of a chameleon, changing with the seasons. In the summer, it’s a tropical tiki hut, and in the spring the space becomes a sugar shack. While the Sky Yard was outfitted last winter in an Olympic motif, this year the hotel’s design team decided to go the ski chalet route. An enclosed, weatherproofed indoor area houses a full bar and several tables. Vintage sleds and skis sit on the walls, and a shelf of vintage blankets are available for those who need a bit of extra warmth. 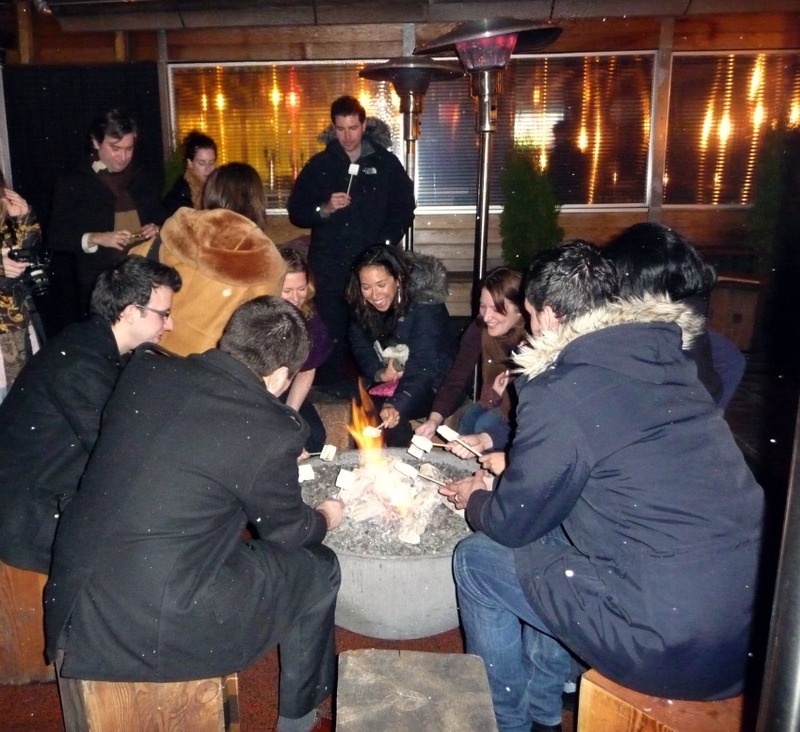 Those who brave the elements and venture out to the rooftop patio will find an inviting space with art installations, a skidoo you can sit on for fun photo ops, and a campfire where you can sit and roast the Drake’s homemade marshmallows to eat alone or as a S’more sandwiched between graham crackers and chocolate. 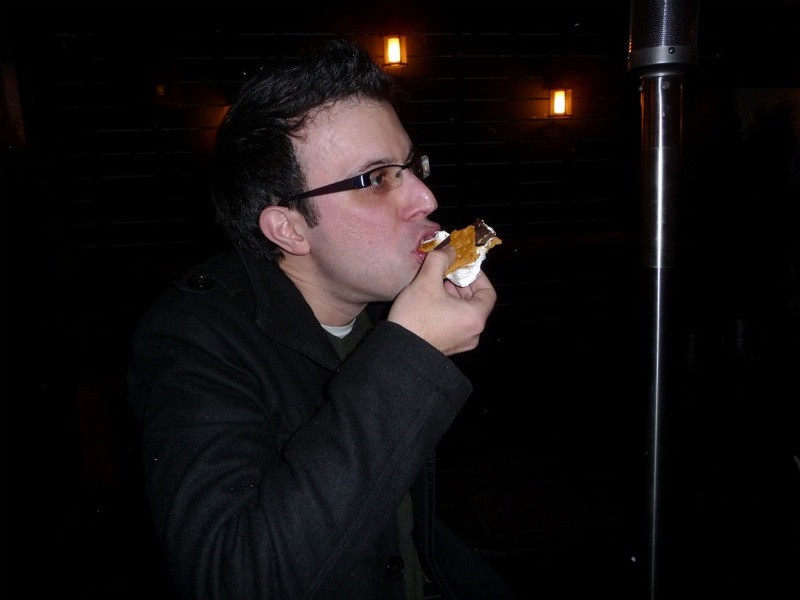 Jenny was shocked to find out that I’d never made a S’more myself prior to our Drake visit, so I made sure to take advantage of the chance to cross it off my to-do list while we were there. 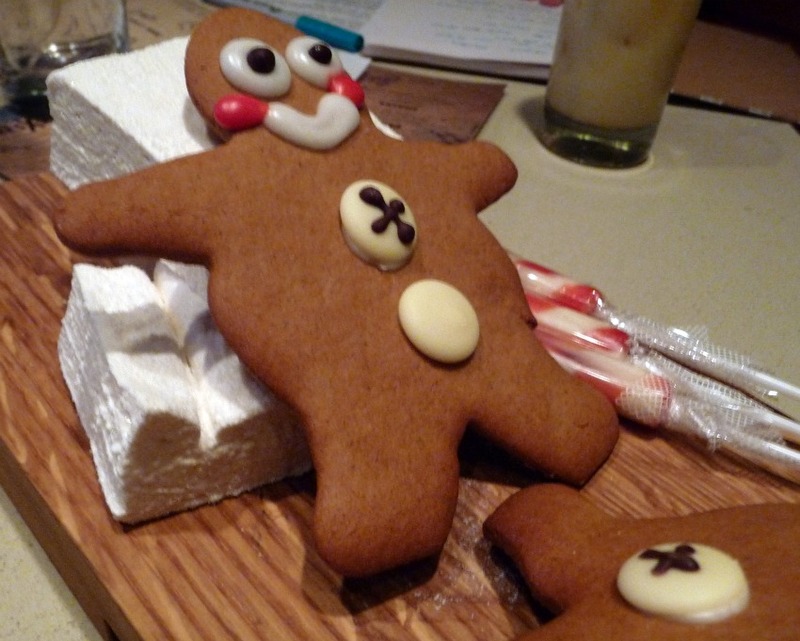 The Drake’s homemade gingerbread men, resting on a pile of their homemade marshmallows. You haven’t had a roasted marshmallow until you’ve cooked a homemade one over a fire. Amazing. 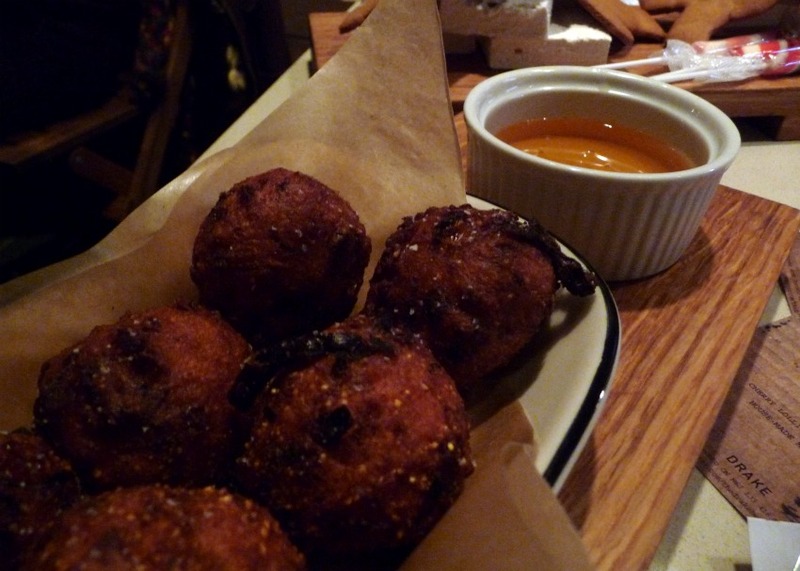 The Drake Hotel’s corn fritters served with wildflower honey. Jenny said she could have eaten a plate full of these. The Drake’s always innovative bar team has come up with a menu of new cocktails designed for winter enjoyment. I love egg nog, and the hotel’s Drake Nog is no exception. It’s homemade, so it tastes much lighter than the store-bought stuff (though I’m sure it’s no better for you); the Drake mixes their nog with Sailor Jerry rum. Then there’s the Boozy Hot Chocolate (my favorite), which combines vanilla liqueur and brandy with hot chocolate, and is topped with homemade whipped cream. And the White Chocolate S’more – easily the best looking of the new winter cocktails – mixes Godiva white chocolate liqueur with homemade chocolate syrup, and is topped with a chocolate-covered graham cracker and a homemade marshmallow. 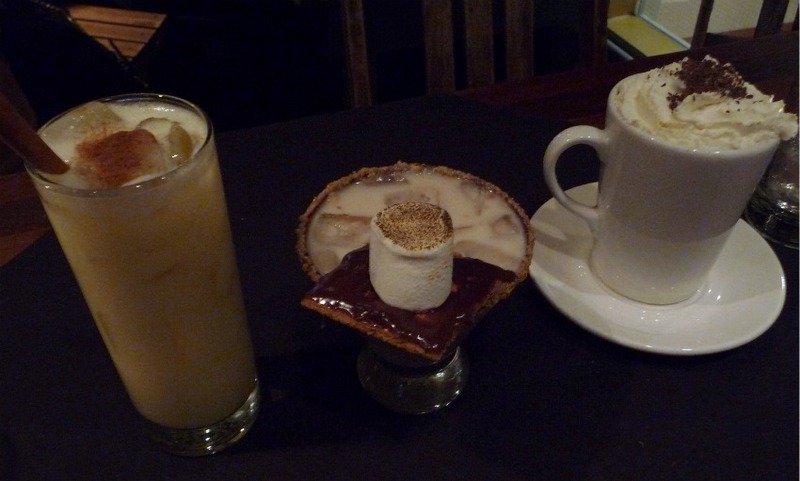 Three winter drinks at the Drake: Drake Nog, White Chocolate S’more, Boozy Hot Chocolate. Great booze. Great food. The choice of hiding inside under a blanket or sitting by the campfire in the snow while roasting marshmallows. A ski-doo. 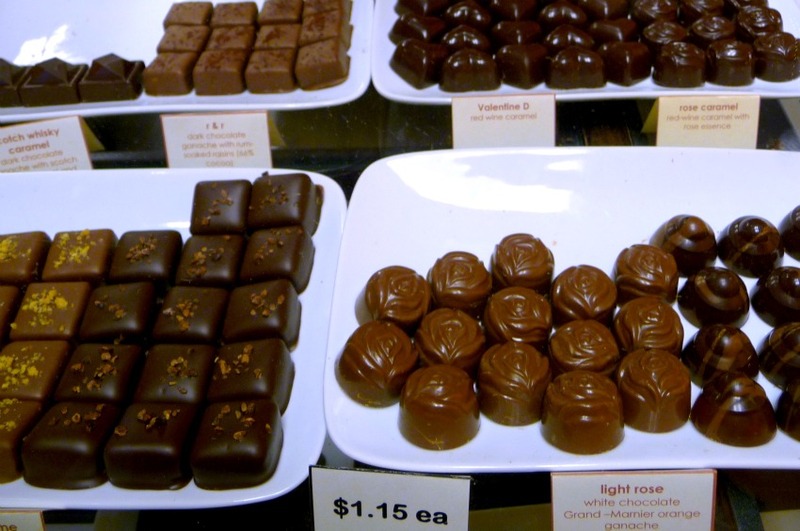 What more could you possibly need to enjoy winter in Toronto? You can check out The Drake’s Apres Ski Sky Yard until March, at which point the space will be reincarnated as a sugar shack to mark the spring thaw and maple tree runoff.